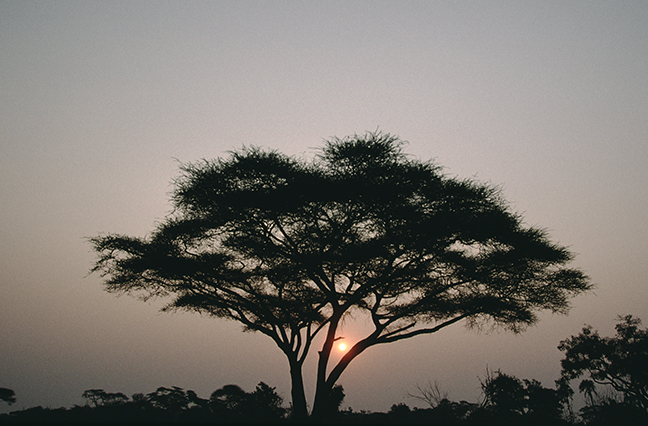 The sun sets behind a Flat-topped Acacia tree in Ngamiland East, Botswana. 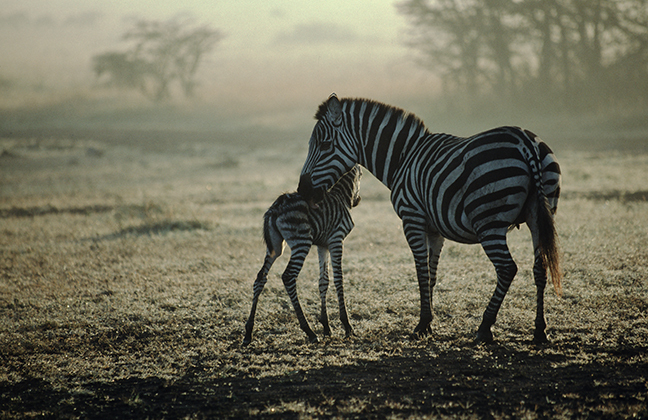 A mother cleans her foal shortly after his birth in the Masai Mara. Foals are able to stand within 15 minutes of birth and able to walk within an hour. 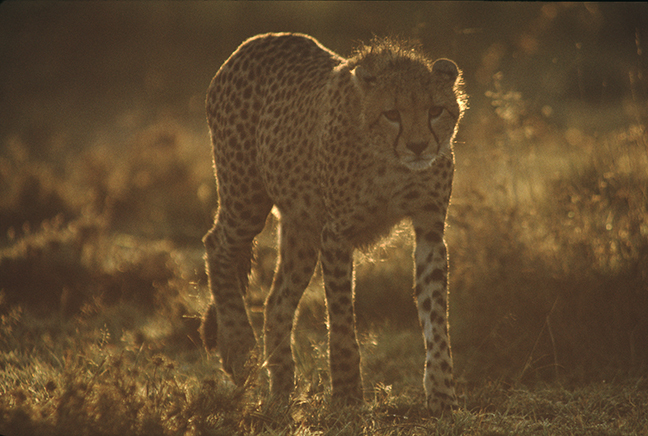 A female cheetah at sunrise in the Masai Mara scans the grasslands looking for prey. Females typically have a litter of three cubs who stay with them for up to two years learning to hunt. They require wide-open grasslands and are under pressure from increased human settlement. An African Wild Dog observes a gazelle in the distance. 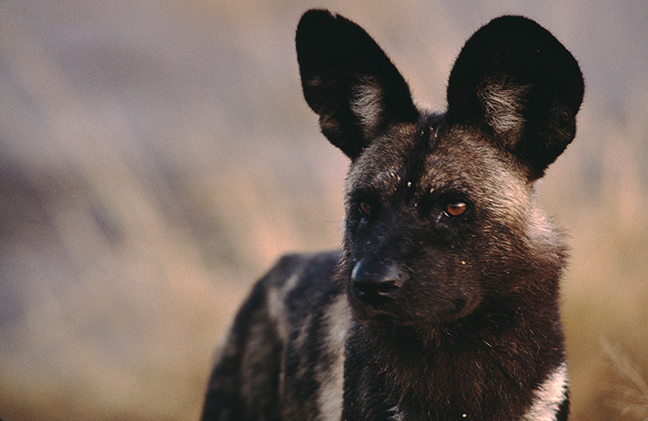 Wild Dogs live in small packs and communally hunt. All males in a pack are related to each other, and all of the females to each other but not to the males. 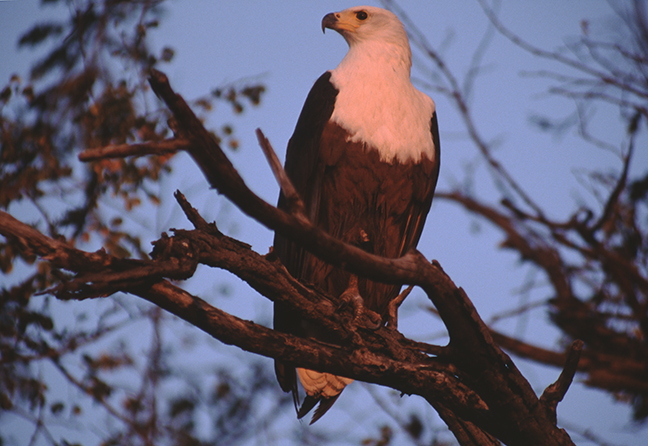 An African Fish Eagle scans a nearby coastline. Fish Eagles catch their prey with their feet and carry off fish weighing as much as five and a half pounds. They also steal prey from other birds and will raid colonies of nesting waterbirds for eggs and young. 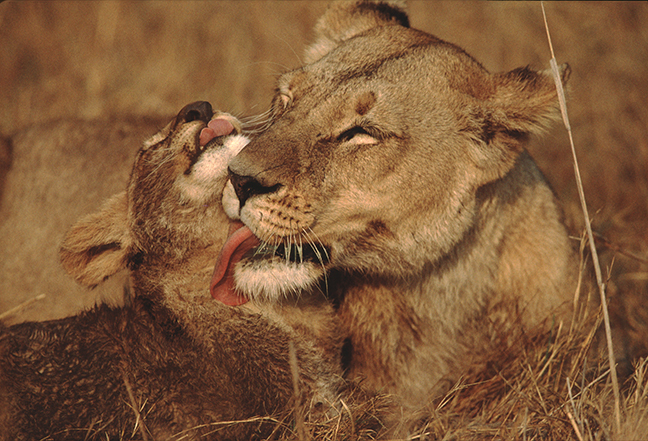 A lioness cleans her muddy cub in the Masai Mara National Reserve in Kenya. Cubs stay with their mothers for up to three years. Most female cubs join their mother's pride, whereas young males always leave the pride in search of unrelated potential mates. 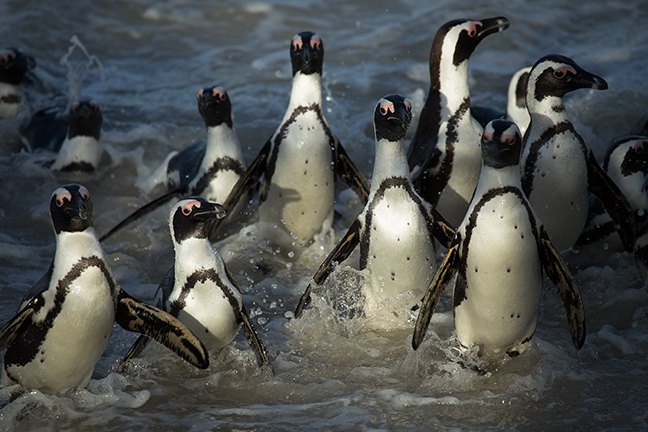 African Penguins are found only along the southern coast and islands off the coast of South Africa. Although not endangered, their eggs are a common source of food for people living in impoverished parts of the country. Populations have decreased in the past 100 years from 1.5 million to around 50,000. A Black Rhino grazes in the Okavango Delta. The Botswana Rhino Reintroduction Project reintroduced Black Rhinos into the Delta in 2003. 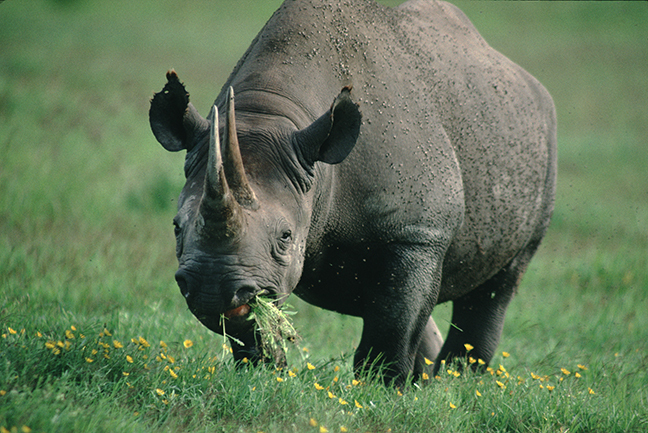 In 1992, the Black Rhino was considered extinct in Botswana due to poaching and hunting. A Black Vervet Monkey chews on leaves and bark in a tree in the Selinda Private Reserve in northern Botswana. 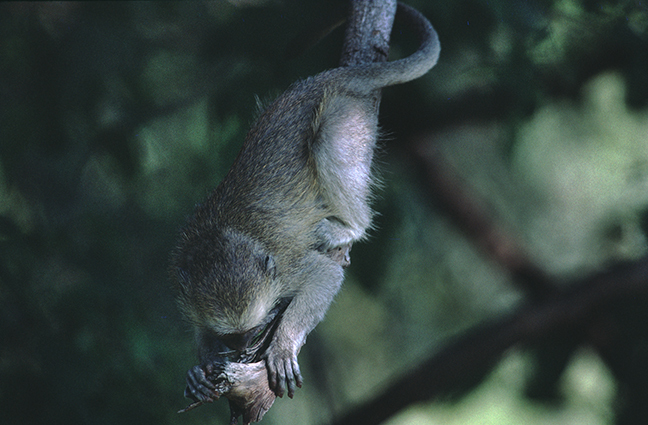 Vervets are mainly vegetarian and rarely venture more than 500 yards from trees as they are potential prey to a variety of predators. A Bokmakierie perches on an African Thorn Tree in the Addo Elephant Park. 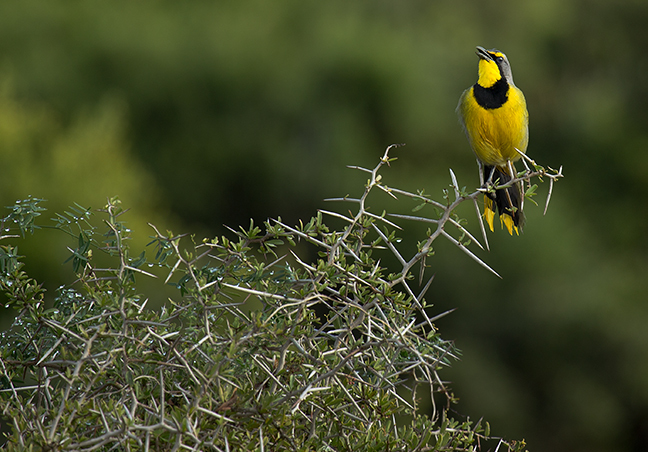 Bokmakierie are a bushshrike that inhabit scrub and fynbos throughout the Park. They are endemic to South Africa and Zimbabwe. 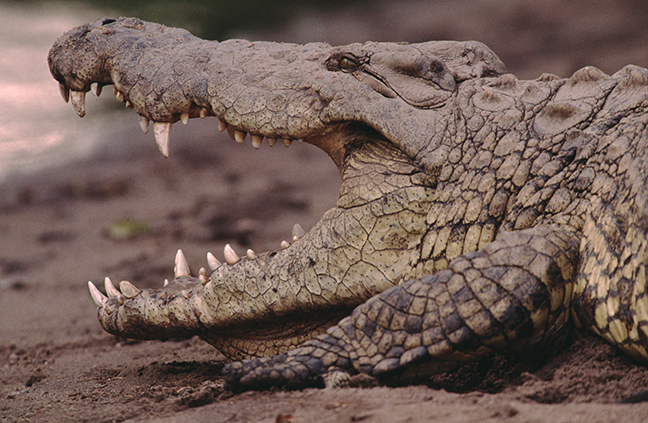 A Nile Crocodile basks along the banks of the Mara River. They are very aggressive and capable of killing almost any animal within their habitat. They are most often ambush attackers, waiting beneath the water to pounce on unsuspecting prey crossing rivers and streams. 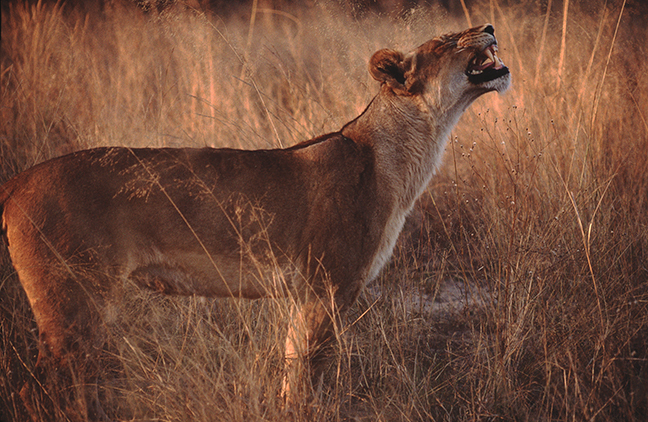 A lioness coordinates a hunt with other members of her pride by emitting a low snarl as dusk approaches in the Moremi Game Reserve in the Okavango Delta. Lions have complex auditory and social communication behaviors within their prides. 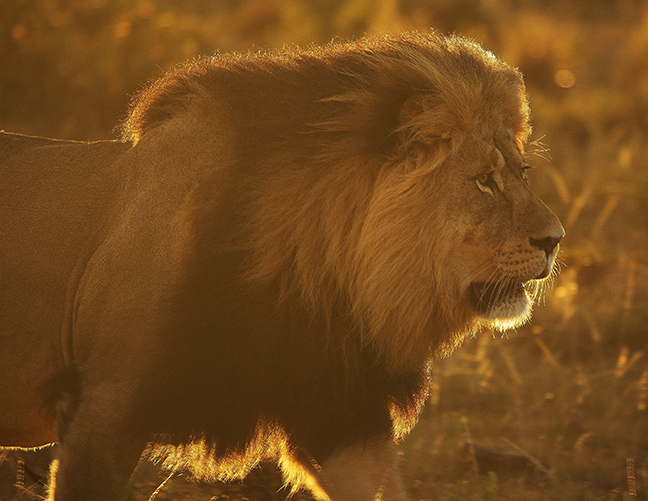 A male lion searches for his pride at sunrise in the Gondwana Private Reserve. Gondwana is situated within the Cape Floristic Kingdom. It is the smallest Floral Kingdom in the world yet the most diverse in terms of plant species and is endemic to South Africa. 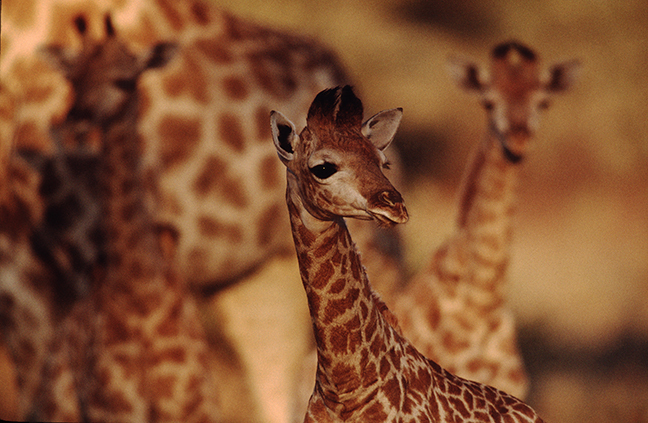 A nursery group of giraffes consists of a number of adult females and their young. The adults take turns feeding while one watches the young. Giraffes prefer to feed on the new growth on the crown of acacia trees. 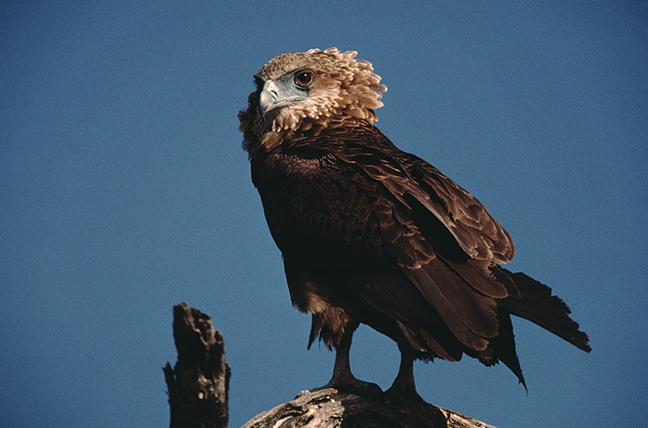 An immature Bateleur Eagle in the Moremi Game Reserve in the Okavango Delta. It takes up to eight years for bateleurs to fully mature into colorful adults with black, brown, white and grey feathers, their signature bright red face and legs and black-tipped beak. 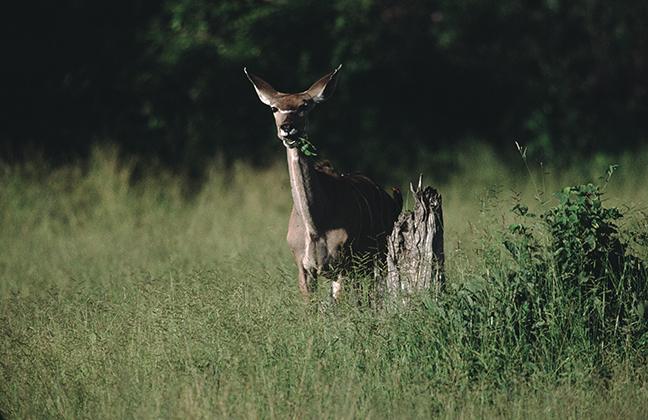 A female Greater Kudu grazes along the Gomoti Channel adjacent to the Moremi Game Reserve. Females often form small groups with their offspring and prefer scrub woodlands that provide a degree of protection from predators. A sub-adult leopard looks for small prey in the Moremi Game Reserve in the Okavango Delta. By the age of two, cubs are independent of their mothers and must find their own prey while avoiding dominant males in new territories. 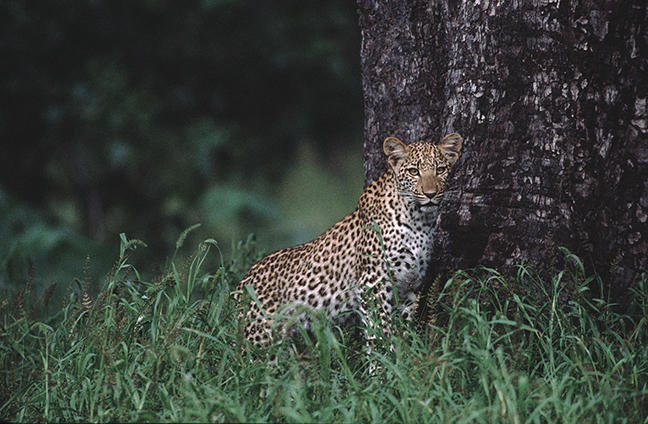 Leopards are solitary and do not live in family groups. 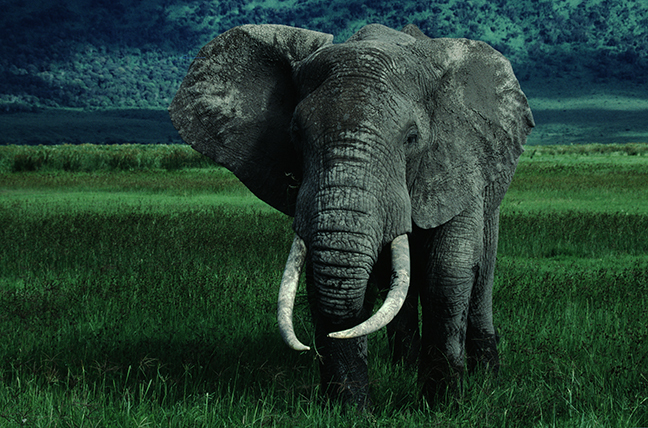 A bull elephant grazes in the Ngorongoro Crater in Tanzania. The 10-mile wide crater is a world heritage site and is the world's largest intact volcanic caldera. The Crater is home to almost 25,000 large mammals and is the most visited tourist destination in the country.